CREATIVE KIDS I is a dynamic and innovative literature-based drama program. 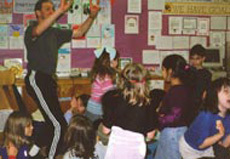 A professional actor/teacher leads the class in exploring and dramatizing specially selected children’s stories. The students then create and act out their own original stories based on these books. The stories come from all over the world and are carefully chosen to be appropriate for the ages in the class. CREATIVE KIDS introduces students to acting, increases their love of books, and is loads of fun – a perfect mix for a great after-school program! Available in Washington DC, Baltimore, Northern Virginia and surrounding areas - now serving 50+ sites. For information, please contact the After-School Program Manager at 301-879-9319. Class size is limited to 15 children (8 minimum). Classes can be scheduled midday, after school or during a summer camp. The cost per child is based on the length of a session, site location, number of classes and enrollment. Discounts may be available for multiple classes. We provide, at no charge, camera-ready Creative Kids promotional materials and registration forms customized for your program. Stories to Stage - an 8-12+ week program. Takes the creativity fostered in Creative Kids I to a higher level! In our Creative Kids II program the students get all the great basic acting training and exposure to literature that Creative Kids I offers (see above). Halfway through the course, they focus on creating their own original story based on one of the books used during the session. They then rehearse their “play” and share it with family and friends in an informal presentation on the last day of class. This class has limited availability. 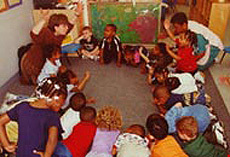 Class size is limited to 15 children (10 minimum). For Sale.” We have acted it out at home at least 100 times.